Hail to You, Ereshkigal, Great Queen of Those Below. Mistress of the Shadows. Lady of Bones and Dust. Frightening One of the Far Places Where Men Fear to Go. Strong One Who Builds the Boundaries and Knows How to Tear Them Down. 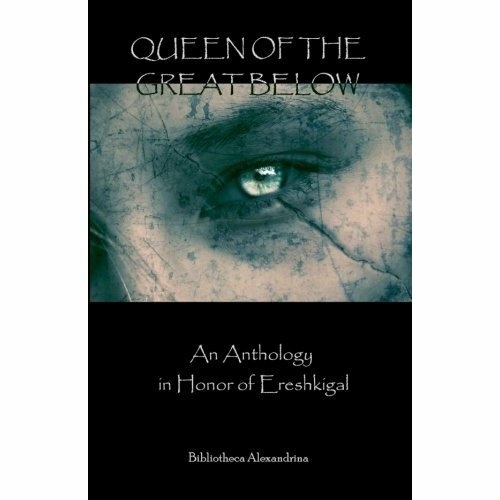 Queen of the Great Below is a collection of poems, essays and personal ritual experiences by modern devotees in honor of Ereshkigal. Once worshipped as Ruler of the Underworld from the shores of the Euphrates to the banks of the Nile, Ereshkigal is now known primarily for her role as the antagonist in The Descent of Inanna. In this unique devotional anthology, however, Ereshkigal is revealed to be a multi-faceted deity of transformation, boundary-keeping, and passion, a teacher of harsh but necessary lessons. You stand at the brink of the Underworld, on the shadowed path that few walk willingly. Those who have contributed to this devotional have walked this road and returned, bearing the blessings of the Queen. We invite you to walk this path, as well. Queen of the Great Below can be purchased for the Kindle here; in paperback on Amazon here and at Amazon.co.uk here; and at Barnes and Noble here. All of the proceeds from Queen of the Great Below – as well as many of the other volumes in the Bibliotheca Alexandrina series – will be used to help promote the revival of the worship of the Greek and Egyptian Gods, with a portion of the proceeds given to a worthy charitable organization in their name. So, not only will you be getting a wonderful book about the modern worship of Ereshkigal – but your money will be going to do good work and help the revival of ancient polytheistic religions. ATTENTION Librarians, Teachers and Retailers: Queen of the Great Below is also available at reduced cost for academic institutions, lending libraries (public and private) and retailers. Check our online store, or email baeditor@gmail.com with any questions. Interviews and Reviews: Check out the Patheos interview with editor Janet Munin, as well as the review by Galina Krasskova. The Everything Magical and Middle Eastern review. And the Life of Joy posting. And the 5/5 review in witches&pagans!